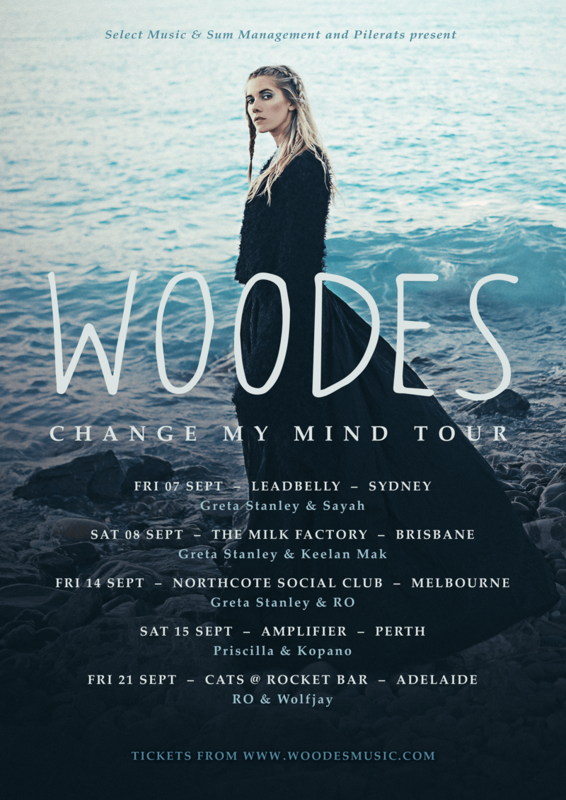 Fresh from her epic performance at Splendour in the Grass, today Woodes has shared the support performers on her upcoming ‘Change My Mind’ national tour. Joining Woodes next month, indie darling Greta Stanley heads along the east coast as her main support – joined by RO in Melbourne, Keelan Mak in Brisbane and Sayah in Sydney. Priscilla and Kopano will be supporting Woodes in Perth with RO and Wolfjay supporting in Adelaide. Woodes new single ‘Change My Mind’ received acclaimed reviews since it’s release and was added to full rotation on triple j and triple j unearthed. ollowing on from her standout 2017 which made her one of the most exciting names in Australian indie music, ‘Change My Mind’ is an angelic cut from the acclaimed artist. The track was written at the New Zealand APRA AMCOS Songhubs recently in Auckland, alongside NZ song writers Marley Sola, Jamie McDell and Alexander Wildwood – who also co-produced the song. Hayden Jeffery, member of Woodes live band worked on additional production and Simon Lam from Kllo worked across the mixing. Woodes also worked with photographer Alexandra Sophie while she was in New Zealand on the artwork, capturing the countries unique and breathtaking landscapes. Woodes released her sophomore EP Golden Hour in early 2018 and was asked to perform for the coveted triple j Like A Version in March 2018, putting a Woodes spin on Vance Joy’s ‘Lay It On Me’. After touring with City Calm Down, BØRNS and Asgeir – catch Woodes returning to a stage of her own on her ‘Change My Mind’ National Tour.